CAMP RUPERTO KANGLEON, PALO, Leyte- Three unidentified suspects carted away P90,000 from victims who were on board a six-wheeler truck in Lapinig, Northern Samar on April 18. 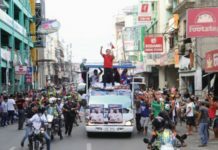 Reports reaching at the regional Philippine National Police (PNP) headquarters, disclosed that the hold-up incident took place along a national of said town at about 9:30 am. 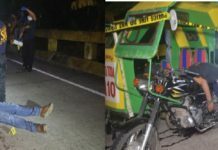 The victims, John Kevin Morallos, 23 and a resident of Barangay Bato, Gamay town, was driving the six-wheeler truck owned by the JB Mini-Mart with Ana Norombaba and Jessebel Duac, were flagged down by the suspects while cruising along Brgy. Alang-Alang of said town. One of the suspects shot the leg of Morallos and immediately took a sling bag containing the P90,000, two mobile phones and three keys of the store. The driver was brought to the Gamay District Hospital for medical treatment while the suspects fled towards the mountainous area of said place after the incident. Recovered from the crime scene was one slug of Cal. 45 pistol.